Please Note: Motorcentral Mobile is only accessible from modern smartphone devices and requires a hosted Motorcentral system. If you are unsure if your Motorcentral is a hosted version or wish to make your current version hosted please contact the Support Team for assistance. You will be presented with one of the following login screens. If not already selected, tap the Motorcentral icon to login. 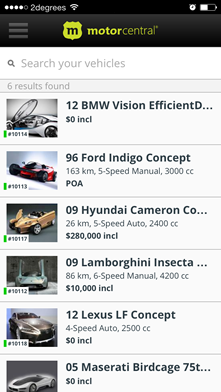 Username: This is your Motorcentral Username. Password: This is your Motorcentral Password. Tap the Login button to complete the login process. 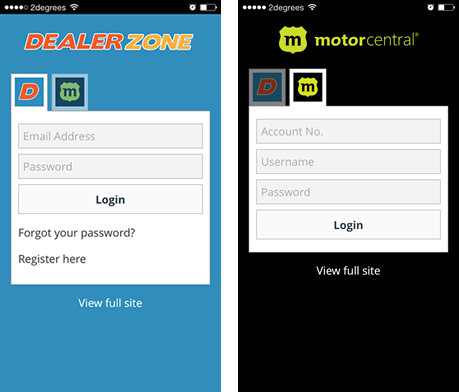 If you have not yet connected to Dealerzone you will be required to do so by entering your email address and agreeing to the Dealerzone Terms & Conditions. 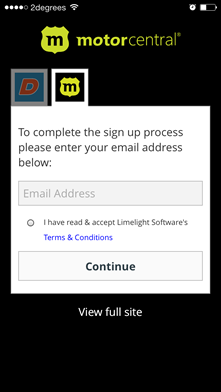 The email address you enter must not already be registered on Dealerzone. If you have issues registering your email address please contact the Motorcentral Support Team who will be able to assist. Tap the Continue button to complete the login process and access Motorcentral Mobile.